Aerospace/Defense contracts offer unique challenges for gear manufacturers. A look at several American organizations doing cutting edge gear-related research for aerospace applications. The U.S. economy has been out of kilter for some time. But Uncle Sam isn't going to bail you out. You're going to have to do it yourself. The complete product news section from the June 2009 issue of Gear Technology. PowderMet 2009, plus the full technical calendar for Gear Technology's June 2009 issue. 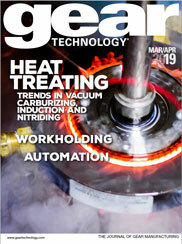 The complete industry news section from the June 2009 issue of Gear Technology. Have you seen the newly created logo symbolozing the scope of President Obama's $787 billion American Recovery and Reinvestment Act?